Will our retreat bring us closer to each other and to God? To answer these common questions, the staff at Montrose created a customizeable set of themed retreats that makes planning a retreat easy and ensures that your group will truly relax, draw closer to each other and to God, and simply enjoy the time spent together. Each retreat plan has a unifying theme with supporting activities that are designed to keep your group engaged and focused on each other. While the theme provides a great framework for a memorable retreat, our planning experts are here to help you customize the retreat experience for your group and goals. It’s the great debate: half of your group wants an exhilarating weekend adventure, and the other half wants a relaxing escape from daily life. You want a location that will foster relationships and spiritual growth. At Montrose Bible Conference, your group doesn’t have to compromise. There’s something here for everyone! Those desiring low-impact recreation can enjoy a board game, unwind by the lake, or loosen tight muscles in our heated outdoor pool. Our magnificent surroundings provide limitless opportunities for restful entertainment: bird watching, photography, painting, and insights for creative writing. Pray along our inspirational spiritual walking path. Crunch through the stillness of a forest peppered with fallen leaves. High-energy guests will love our indoor climbing wall, geocaching treasure hunt, and mountain boarding trails. Discover the excitement of designing and blasting a paper rocket up to 300 feet in the air. Our paintball field, snow tubing run, and cardboard sled race provide our most daring guests with a spine-tingling adrenaline rush. Our giant swing will send you hurtling through the treetops at 35’ above the forest floor! Opportunities for long-lasting spiritual growth abound at Montrose Bible Conference. Our chapel provides you with a comfortable setting to meet as a large group and hear God’s message. The serene backdrop of the mountains is ideal for personal reflection. Our team-building activities help to develop relationships with each other and the Lord. Between rounds of paintball, participants will find themselves challenged with questions about spiritual warfare and eternal destiny. No matter which activities appeal to the members of your group, you can be sure everyone will love the time spent at Montrose growing in relationships with each other and with the Lord! 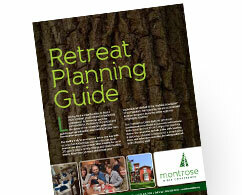 Get your FREE retreat planning guide and discover how Montrose takes the stress out of retreat planning.